For others of us, the recycling of our remains is not enough. Remembering that we are dust and to dust we shall return strikes us as bleak, and we long to be more than just the sum of our parts. We long to be more than just the stuff that is housed in our bodies. We want more than just this present incarnation of dust. We fear the inevitable decomposition of who we know ourselves to be. We can’t help wondering what lies beyond the dust that we are. Most of the time, we can keep our fears under control as the demands of our bodies to be fed, watered, and amused keep us busily scurrying to and fro, this way and that, with precious little time to spare. Day after day we avoid the questions our mortality stirs in us. From time to time, we catch sight of our aging selves in mirrors that reflect the passing of years as we journey closer to our own earthly demise. Sometimes a nagging pain, a frightening diagnosis, a sudden impact, the death of a friend, or a night like tonight reminds us that we are dust and to dust we shall return and we are forced to deny the reality of our eventual demise because it is just to frightening to contemplate; or to embrace the reality of our dustiness trusting that the Love that lies at the heart of all that is will not abandon us to the abyss of nothingness. Our denial of our eventual death can take many forms. Much of what passes for Christianity these days is wrapped up in our fearful denial that we are dust and to dust we shall return. Popular images of heaven and angels bolster our denial with promises of an afterlife to placate our fears. Visions of fluffy clouds and an eternity inhabited by more splendid images of this life as together with loved ones we continue on much the same as we have always been, with only a change of scenery to get used to as we hop from cloud to cloud surrounded by the sounds of celestial choruses belting out our favorite tunes. It comforts us to let ourselves be caught up in the pursuit of heaven and life everlasting. So, we craft our faith in ways that demystify our existence. But not tonight. Tonight the ancient truth of our reality infuses our ritual as we remember the stardust from whence we came, celebrate the dust that we are, and declare the reality of the dust to which we shall return. Tonight, we hold up the reality of our own death and the death of those we love and we summon up the courage to enter into the mystery of what lies beyond the dust. And if we dare, we do not placate our fear with illusions because we know that the illusions cannot hold. We know our own limitations. We know that, we cannot know. We only know that we are dust and to dust we shall return. All else is speculation, illusion or denial. All else is our attempt to stop the panic from rising inside of us. None of it can save us from the reality of our own death. So, tonight we summon up our courage to focus upon our own inevitable death. Tonight, we do what we can to embrace death; to embrace our own mortality, for it is our death that brings meaning to our life. If it were not for death our lives would be infinitely less valuable. Death lies at the very heart of what it means to be human; for we alone among the creatures of creation are conscious of our own eventual death. The knowledge that we shall die makes us human. This knowledge transforms us from mere dust into conscious beings. It is the knowledge that we will surely die that gives rise to hope in us. The knowledge that our time here is short drives us to fulfill our hopes and dreams for life here that is fuller, lovelier, more intense, vivid, grace-filled and alive; alive to all that is possible here and now. While some placate their fears with hopes that point to everlasting life, those of us who embrace the reality that we shall die, know that everlasting life would be everlasting punishment. Life without death is life without change. Eternity is not just more of the same. Eternity has no beginning and no end. Eternity is beyond time. Here and now when we live fully, we can catch a glimpse of the eternal, when time and space fall away and we are conscious that we live and move and have our being in, and with, that which is beyond our ability to comprehend or express, that eternal beyond that we call Love, or God. When we embrace the limitations imposed upon us by death, we are compelled to live fully, love extravagantly and be all that we can be. By embracing our mortality we can become more fully human and in being more fully human we open ourselves to that which is eternal. So, tonight as the ashes are imposed upon our foreheads let us remember that we are dust and to dust we shall return. Let us remember that the very dust that the stars in the sky were made of is the stuff of which we too are made. 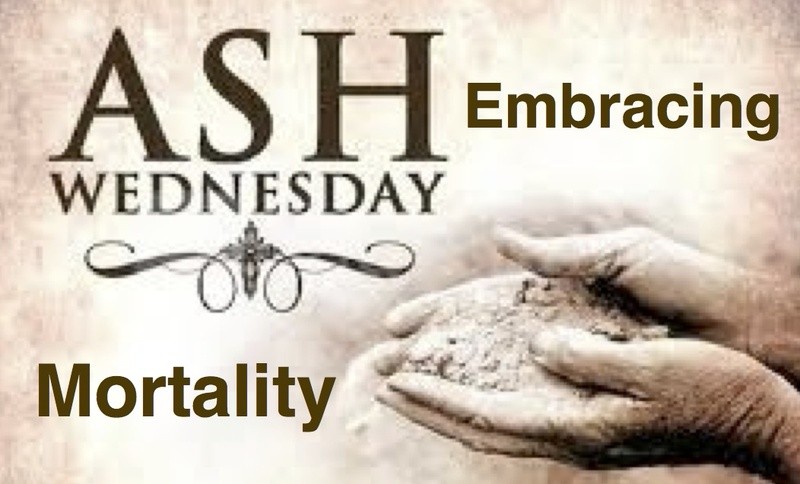 Let us also remember that our humanity is dust and to dust it shall return and let the reality of our death enable us to live more fully, love more extravagantly and be all that we can be so that we can experience the eternal here and now. As for what the fullness of eternity holds for us, let us trust the One in whom we live and move and have our being, the One who knit us together in our mother’s womb, the One who is was and ever more shall be, to hold our very being in LOVE. Let us trust the ONE who raised us up from the dust, to enfold us into Eternity, trusting that in LOVE all shall be well, and all manner of things shall be well. This entry was posted in Evolutionary Christianity, Home, PONDERING PASTOR, Progressive Theology, SERMONS, Theology and tagged Ash Wednesday homily, Ash Wednesday reflection, emergent theology, emerging church, Lutheran Ash Wednesday Sermon, Progressive Christian Ash Wednesday sermon, progressive christian spirituality, progressive theology by Rev. Dawn Hutchings. Bookmark the permalink.